The brown marmorated stink bug is easily recognized by many because it’s invading our homes. 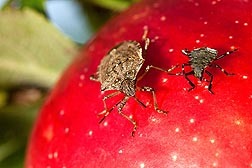 But the pest, shown here feeding on an apple, is also a major economic threat to fruit crops, garden vegetables, and many ornamentals. ARS scientists are fighting back by developing traps, sequencing the bug’s genome, and testing parasitic wasps as biocontrols. The brown marmorated stink bug (BMSB) is wreaking havoc in U.S. homes, gardens, and agricultural operations, causing personal and economic woe. Agricultural Research Service scientists are exploring various aspects of monitoring and control of this increasingly important insect pest, which is an invasive Asian species known as a sporadic pest of many tree fruit crops in China, Korea, and Japan. Along with being a household nuisance, it is a major economic threat to producers of orchard fruits such as apple, peach, and pear; garden vegetables and row crops; and many ornamental species. Since its detection in the northeastern United States a decade ago, the BMSB has been detected in 38 states and has earned the distinction of being classified as the top invasive insect of interest by the U.S Department of Agriculture. With economic losses to the apple industry estimated at $37 million in 2010, the bug’s threat to apple growers prompted a Member of Congress to organize a public hearing in western Maryland. There is also concern about the potential damage it could cause to vineyards in California and other states. Tracy Leskey, with the Appalachian Fruit Research Station in Kearneysville, West Virginia, is the principal investigator of the research group, which includes several scientists in ARS’s Invasive Insect Biocontrol and Behavior Laboratory in Beltsville, Maryland; Jana Lee, an ARS entomologist in Corvallis, Oregon; and Kim Hoelmer, director of the USDA-ARS European Biological Control Laboratory in Montpellier, France. 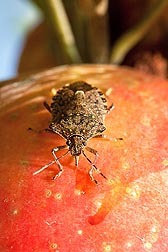 A major project led by Leskey, funded through the USDA-National Institute of Food and Agriculture’s Specialty Crop Research Initiative Program, is called “Biology, Ecology, and Management of Brown Marmorated Stink Bug in Orchard Crops, Small Fruit, Grapes, Vegetables, and Ornamentals.” While this is a mouthful, it goes to the heart of the damage that can be caused by this pest. The project is funded for 3 years with $5.7 million in federal funds and $7.3 million in matching funds. The group includes ARS, Pennsylvania State University, Washington State University, North Carolina State University, Virginia Polytechnic Institute and State University, Rutgers University, Northeastern IPM Center, Oregon State University, University of Maryland, University of Delaware, and Cornell University. The project will take advantage of research that ARS scientists have conducted on BMSB since it was detected in the United States in 2001. The project’s progress can be followed on its website, stopbmsb.org. Leskey has focused on visual stimuli that can, in addition to odor stimuli, attract the BMSBs to traps that will help farmers monitor the level of infestation in fields. Support scientist Starker Wright (left) and entomologist Tracy Leskey inspect traps baited with experimental pheromone lures. The lures are being tested for brown marmorated stink bug attraction. Technician Brent Short counts the number of adult males and females and other life stages of brown marmorated stink bugs captured in traps baited with experimental lures. Researchers at the ARS Invasive Insect Biocontrol and Behavior Laboratory (IIBBL) in Beltsville, Maryland, are leading the pivotal pheromone research efforts and genomics studies and partnering with Leskey on field tests of potential attractants for use in commercial traps. Scientists at IIBBL were working on the BMSB long before it became such a huge problem in the United States. Aijun Zhang, an analytical chemist, started looking for the BMSB pheromone in 2003, along with Ashot Khrimian, a synthetic chemist, and Jeff Aldrich, an entomologist who retired in 2011. Khrimian and Aldrich published results in the Journal of Agricultural and Food Chemistry and in Tetrahedron, showing that a compound identified as a pheromone of another stink bug was also a late-season attractant for the BMSB. When the BMSB emerged as a major pest in the United States, Aldrich and Khrimian began helping U.S. manufacturers develop traps with the attractant. “Our work has already led to successful commercial products now on the market. But what we now have is only a late-season attractant, and because that doesn’t help growers as much as we would like, we still have work to do,” Khrimian says. ARS scientists at Beltsville, Maryland, analyze reaction products to evaluate purities of synthetic lures for brown marmorated stink bug. 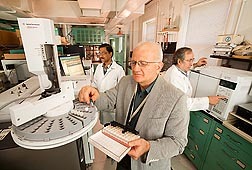 Left to right: chemists Shyam Shirali, Ashot Khrimian, and Filadelfo Guzman. In 2010, the team of scientists at IIBBL found an “aggregation pheromone” that shows promise as the main pheromone attractant for BMSB. This pheromone is released by males when they feed, and it attracts both males and females. The scientists are trying to determine the chemicals that make up the pheromone. They are working on identifying the specific isomers (structurally related chemicals) that the stink bugs may be releasing to attract other stink bugs to feeding sites. They are trying to identify the various combinations or ratios of attractant isomers that will produce an affordable and efficient lure, Khrimian says. The mixture and components were also evaluated in field trials this summer in Beltsville, Kearneysville, and elsewhere. Don Weber, who is overseeing the Beltsville field studies, set up traps with the different candidate formulas and twice each week counted the numbers of male, female, and nymphal (immature) stink bugs they attracted. These pyramid traps, based on those designed by Leskey, are similar to those developed for weevils and pests of woody fruit. They have a screen funnel that allows the stink bugs entry, but inhibits exit. Lures with the experimental formulas hang alongside kill strips inside clear plastic containers. A provisional patent application was filed, and the researchers hope to include results from the summer field trials in supplemental data that will be filed as part of the completed patent application. 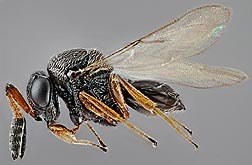 A female parasitoid wasp, Trissolcus mitsukurii, from Asia. This species is one of several parasitoids being evaluated as potential biocontrols of brown marmorated stink bug. Dawn Gundersen-Rindal, research leader of the ARS Beltsville group, has been working with scientists at Baylor College of Medicine to sequence the stink bug’s genome. The sequencing is part of an international effort, known as the “i5K Project,” to sequence the genomes of 5,000 insects. Because it is such a nuisance to homeowners, a threat to agriculture, and rapidly spreading in the United States, the BMSB is one of the group’s top priorities, she said. “Sequencing the genome will tell us about the genes that give this insect its defense mechanisms and its ability to respond to threats, such as pathogens that we might want to use against it. It might give us clues, for instance, how it may develop resistance to insecticides,” she says. Separate from the sequencing project, Gundersen-Rindal is looking for genes that might be unique to the stink bug or make it vulnerable to specific treatments. “We hope we can find critical genes and use them against the stink bug by developing molecular biopesticides that address some weakness unique to its genetic makeup,” she says. 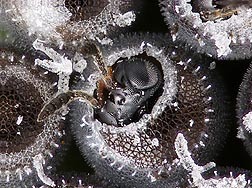 An adult parasitoid insect emerging from an egg of a stink bug. After a parasitoid female wasp lays an egg into a stink bug egg, the parasitoid offspring (one per egg) develops inside the egg, eating it from the inside out. Another approach to reducing the population of BMSBs is classical biological control—using its natural enemies to help keep its populations in check. Hoelmer continues work he began at the Beneficial Insects Introduction Research Unit in Newark, Delaware, to find parasitoid insects that may lend a hand. Surveys conducted in the United States found that native stink bug parasitoids are not capable of controlling BMSBs, so it is important that more effective biological control agents from Asia be identified, tested, and eventually imported to the United States. Hoelmer has collected some of these parasitoids during foreign exploration in collaboration with the USDA-ARS Sino-American Biological Control Laboratory, in Beijing, China, and is now testing them in quarantine culture in Newark to determine their specificity for the BMSB. Each of these research disciplines is needed to control BMSB populations in the United States, which will help farmers and homeowners alike. The project is an example of how USDA and ARS have the organization, infrastructure, and expertise to move quickly toward solving an emergent problem for agriculture.—By Sharon Durham and Dennis O'Brien, Agricultural Research Service Information Staff. This research is part of Crop Protection and Quarantine (#304) and Methyl Bromide Alternatives (#308), two ARS national programs described at www.nps.ars.usda.gov. To reach scientists mentioned in this article, contact Sharon Durham, USDA-ARS Information Staff, 5601 Sunnyside Ave., Beltsville, MD 20705-5129; (301) 504-1611. 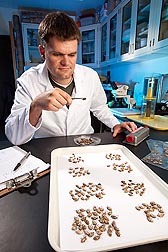 "ARS Works Toward Control of Brown Marmorated Stink Bug" was published in the January 2013 issue of Agricultural Research magazine.